Our biggest circus rescue to date and ADI has saved over 80 animals in Peru and Colombia. Over thousands of miles, we tracked down and seized animals from circuses, street performers, and restaurants and illegal trafficking. There are no more wild animals in Peruvian circuses – but we will keep watch. Over half of the animals have been rehomed and we are working on the homes for the 33 lions, Hoover the tiger, Mufasa the puma, Cholita the bear and our new animals seized in July. Ted the tortoise returned to the wild; Condorita the condor went to a condor centre; Peru’s Air Force helped relocate Pepe’s spider monkey family, Fausto and the woolly monkeys, the two groups of capuchins, the owl monkeys, coatis and kinkajous – 39 in total. 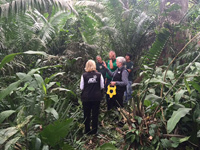 All now enjoying their protected ADI Amazon habitats at Pilpintuwasi, near Iquitos, Peru. Back to the jungle! When our veterinary team advised that Cholita was not fit to go on an international flight, it turned out to be a lucky break for our elderly bald lady bear! We said we would build her a paradise home in Peru, and we found it. As I write, work has started on rainforest habitats for Cholita and Mufasa (and eventually Dominga) at Taricaya Ecological Reserve, next to the cloud forest that is the natural range of spectacled bears. It is right next to the Tambopata National Reserve – the Peruvian side of the beginning of the Amazon basin. Mufasa the elderly mountain lion, cut from his circus chains in April, will be heading to Taricaya too, along with our new rescues – PepeLucho spider monkey, Mr Rojas woolly monkey, and a macaw called James. At Taricaya, which has already successfully created families seized from illegal traffickers and released them into the wild, there is a good chance that James, Mr Rojas and PepeLucho can be rehabilitated and returned to the wild. 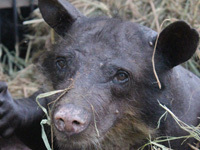 A friend for Cholita: Dominga is another bald lady spectacled bear who needs a home and the zoo where she lives has agreed to hand her to ADI. So she will be Cholita’s first neighbour! But we must complete the work for Cholita, Mufasa and the lions before we can embark on another construction. As you may recall, our plan had been to take all the lions to a sanctuary in the US, but a series of welfare and other concerns emerged and we decided it was no longer in the best interests of these lions to go there. We decided to look elsewhere. We have been moved by the offers of help from around the world and for the past few weeks we have been visiting potential homes. We believe we have the perfect home for the lions and are excited to tell you all about it as soon as arrangements are confirmed. There is an enormous amount to consider when dealing with 33 lions and a tiger, including: building the habitats, policies of the home and long-term care, the weather and environment, government officials’ priorities, permits, flight schedules, loading and ground transport and individual needs of each animal. Although we began seizing animals from circuses over 9 months ago, we only completed operations in July. Peru has been long drawn out and difficult and the violent resistance of the circus owners together with the many places to hide in mountains and forests, has made it tough. But we simply could not, ever, give up. The lengthy rescue means that some animals have been in our care at the ADI Spirit of Freedom Rescue Centre for longer than others, but we know all our animals were glad to be out of the circus early rather than later, and of course, the last ones to be rescued are very glad they were not left behind! This has given us time to gain the trust of the animals and teach them that they will never, ever be punished again, no matter what. We have responded to their anger and fear with love, kind words, toys and care. They can sleep content, feeling safe and comfortable – lying on cosy beds for the first time in their lives. For every animal, time in the ADI rescue centre is vital. We have a larger permanent veterinary team than sanctuaries because so many different species arrive in a short space of time, all from terrible situations with various ailments and injuries. From severe parasite or bacterial infections to injuries, damaged organs, broken teeth and cataracts – our veterinary team must stay on their toes! Every animal ADI has rescued during Operation Spirit of Freedom has needed veterinary attention with many requiring surgery. We have arranged three waves of dental and general surgeries involving specialists – dentists, anaesthetists, surgeons, ultrasound and others. Our special vitamin and mineral supplements with their food every day mends malnourished bodies, bringing them back to health, with bright eyes and deeper colour in their coats. For darling old Leo, the vitamins and improved diet meant that a diet-related cataract blocking almost all of his vision in one eye shrank and moved, allowing him to see again. We have been able to assess the sight problems of Joseph and Ricardo, which will have a significant bearing on their forever home. 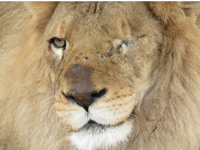 The lions that were aggressive and nervous are now calm and will be able to join prides. All of this takes time and patience. We have expanded our facilities with new exercise enclosures for more space to make more introductions and socialisation to make family prides. We plan to move the lions in October, so their flight will only have been delayed a few weeks later than planned, but it will have been well worth it when they go to their new home – forever. Operation Spirit of Freedom has been a challenge and a success. For the second time ADI has closed down the cruel circus industry in an entire country. We have rescued three times as many animals as anticipated, expanded animal rescue facilities and helped the government wildlife campaign. This lasting legacy and saving more lives has come at a cost. Operation Spirit of Freedom is expected to cost approaching $1.5 / £1 million – so we must raise at least $350,000 / £220,000 to finish the job and see all of the animals into new homes. This is why I am asking you today to help us – every penny helps. These are large groups of animals for the sanctuaries to take, so ADI must fund the long term care of almost every animal. We have already paid for the construction of the homes in Pilpintuwasi and are now building the homes for Mufasa and Cholita. Then we build homes for 33 lions and pay for their flight. Please help this mission – hold a Spirit of Freedom fundraiser at home, or sponsored events, collections at work, school, or college. Do you know any local businesses that may like to participate in Operation Spirit of Freedom? We would be delighted to talk to them about sponsorship. We can make the difference!